A new species of the iconic North American Ice Age prehistoric elephant (Mastodon) has been recognised. Writing in the academic journal PeerJ, scientists including researchers from the Western Science Centre, California State University, the U.S. Geological Survey and the Department of Earth and Environmental Sciences (Vanderbilt University), in collaboration with other institutions have named Mammut pacificus based on Californian fossil material and specimens from southern Idaho. 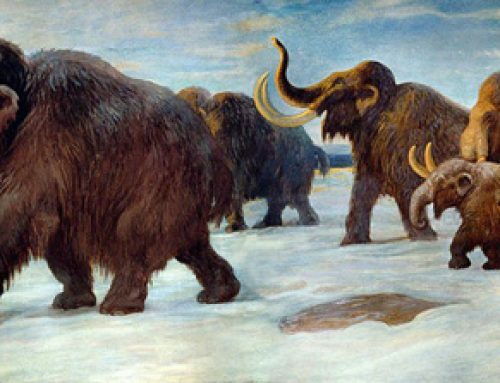 This is the first new North American Mastodon species to have been reported in fifty years, ironically, this new Ice Age giant was hiding in plain sight for several decades. Mammut pacificus cranial fossil material. Cranium in: (A) dorsal, (B) ventral, (C) left lateral, (D) right lateral, (E) posterior, (F) distal end of left tusk (I1), lateral, and (G) right tusk (I1), lateral view. Scale equals 10 cm. The Californian fossil material was excavated from the Diamond Valley Lake site in the 1990’s. A huge reservoir was being constructed and during the building work in Riverside County, more than 700 Mastodon fossil bones, representing over 100 individuals were discovered. In total, more than 100,000 skeletal fossils were unearthed during the reservoir project, providing palaeontologists with an insight into the Pleistocene fauna of the western United States. This material, in conjunction with further Mastodon fossil finds from the construction of the Ziegler Reservoir in Snowmass Village (Colorado), have enabled scientists to build up a much bigger dataset of western North American Mastodon fossils. With more Mastodon fossils to study, palaeontologists have been able to identify subtle differences in bone and tooth morphology that cannot be put down to individual variation within a species. American Mastodon scale drawing – (Mammut americanum). In the scientific paper, the scientists note a number of physical differences between their proposed new taxon and Mammut americanum. M. pacificus is described as having more vertebrae within the pelvic region (six sacral vertebrae), a lack of any lower tusk in the jaw and a different shaped femur (thigh bone). The mid-shaft diameter of the femur is proportionately greater in the Californian specimens. In addition, the molars are smaller and narrower, even when ontogenetic characters are accounted for. WSC 18743, M. pacificus holotype pelvis. Pelvis in dorsal view. Orthographic view of photogrammetric model. Scale = 10 cm. The researchers claim that the cumulative evidence strongly points to the discovery of a new species. Furthermore, all known Pleistocene Mammut remains from California are consistent with their diagnosis of M. pacificus. This suggests that M. americanum was not present in California. The Californian population may have been isolated from the rest of the Mastodon population for thousands of years, giving rise to a new species. The scientific paper: “Mammut pacificus sp. nov. A Newly Recognised Species of Mastodon from the Pleistocene of Western North America” by Alton C. Dooley Jr​, Eric Scott, Jeremy Green, Kathleen B. Springer, Brett S. Dooley and Gregory James Smith published in PeerJ.